Despite a valiant rearguard action by Berkshire’s Lissy MacLeod and Fi Morris, it was Somerset who finished on top of today’s fifth-round Championship contest, gaining their first victory of the season thanks to early inroads into Berkshire’s top order by Moira Comfort (3-21). With Berkshire chasing just 139, Somerset needed to strike early, and they did, with Comfort’s dippy medium-pace proving difficult to negotiate. Linsey Smith (3) was first to go, caught by Cassie Coombes at mid-on in the fourth over. Four overs later she was followed back to the pavilion by Heather Knight, bowled off her pads for 8. By the time Comfort took her third wicket, having bowled unchanged for 10 overs, Berkshire had slid to 38-5 and their target looked of Everest proportions. Nonetheless they got within tantalising reach, thanks to a 46-run eighth-wicket partnership between MacLeod and Morris (24). While MacLeod batted in her usual carefree fashion for a well-deserved 54*, Morris’s effort was particularly brave given that an injury sustained earlier in the day was restricting her movement considerably. Sadly she could not quite see her team over the line, falling to Anya Shrubsole’s penultimate ball of the day. Berkshire were eventually all out for 124, just 16 runs short of their target. It transpired, then, that Somerset’s 139 – made on a stodgy Midsomer Norton pitch, which three days earlier had been entirely under water due to a flash flood – was just enough to see them home. While Berkshire, despite the absence of leading strike bowler Lauren Bell from the attack, did not bowl badly – two wickets in two balls from the ferocious-looking Rachel Hardy being a particular highlight – they will no doubt be ruing their performance in the field. Georgina Adcock (25), Sophie Luff and Anya Shrubsole all survived early chances, and while Luff did not make hay – trapped lbw to Immie Brown for 9 – the other two most certainly did, with Shrubsole finishing unbeaten on 60. After their shock loss to Surrey last time out, defending county champions Yorkshire got their season back on track with a fairly straightforward win against Berkshire at Finchampstead Cricket Club. Chasing 155, Yorkshire got off to a strong start, as Lauren Winfield (76) and Hollie Armitage (19) put on 76 for the first wicket. As the scorecard suggests, Winfield was dominant, despite an excellent opening bowling spell from Berkshire’s 15-year-old prodigy Lauren Bell, who attacked the batsmen with pace and movement off the pitch into the right handers. In the end it was Bell who helped to break the opening partnership, taking a cool catch to dismiss Armitage, as she top-edged Fi Morris to point. Elise Good (19) then joined her skipper to take Yorkshire past the hundred mark. From 112-1 Yorkshire wobbled slightly, losing 5-12, before Hania Thompson (18*) and Dani Hazell (9*) steadied the ship to carry them home. Earlier in the day, Berkshire captain Heather Knight had won the toss and elected to bat on what looked like an interesting pitch. Berkshire made a slow start, with Katherine Brunt causing all sorts of problems steaming in down the hill, making even Heather Knight look foolish on a couple of occasions; so after 10 overs, Berkshire were just 30-1 and Yorkshire looked well on top. Knight went on to make 65, before chipping Dani Hazell to deep midwicket where she was caught by Hayley Martinus, and Carla Rudd also played nicely for 36 – her highest ever score in senior county cricket; but no other Berkshire batsman made it into double figures, and they were eventually bowled out for a below-par 155 in the 45th over. Andy Lynch reports on MCC’s recent match against Oxford University. Lovely venue, perfect weather, idyllic scene – it is easy to imagine that Hugh de Selincourt had days like these in mind when he wrote his classic ‘The Cricket Match’. To complete the picture, all that was needed was a close finish – but MCC Women showed their experience in easing to a 69 run win over a spirited Oxford University side in the Parks. This long standing fixture has been keenly contested over recent years, at a ground that practically breathes history – from the pavilion nestling within the beautiful Oxford Parks, to the engraved Blues teams on the walls for each season since Victorian times, to toilets that we strongly suspect date back to the Edwardian era. Unlike some sporting institutions in the news of late, Oxford does welcome females, and this long standing fixture has been keenly contested over recent years. Results have ebbed and flowed – an Evelyn Jones-inspired victory by Oxford in 2013 prompted MCC to return ‘tooled up’ in 2014 via the inclusion of Claire Taylor and Charlotte Edwards. MCC proceeded to rattle up 360, win by 275 runs, photo-bomb Oxford’s team photo and doubtless pin the opposition to the wall and take their pocket money before allowing them home. It was another strong MCC team who turned out again this year, with Mesdames Taylor and Edwards once again providing a more than solid look to the middle order. MCC won the toss and naturally batted first in perfect sunshine – a serene opening partnership between Genevieve Porter and Amanda Potgieter saw them move to 96-0 at the halfway stage of their 40 over innings. Oxford’s bowling impressed throughout however, and when the opening partnership was finally broken at 109, wickets started to fall with increasing regularity. Potgieter departed for a belligerent 64 off 83 balls, and steady bowling supported by some impressive fielding (a stunning boundary catch by Laura Down to dismiss Clare Ross being a particular highlight) saw MCC eventually being restricted to 202-9. The dismissal of Charlotte Edwards for just 9 by Sam Moore whilst attempting an extravagant reverse sweep was something of a bonus, although it could have been even better had 43 extras not been conceded (including 27 wides). A special mention to the opening pair of Sam Moore (2-29) and Immy Brown (3-28), who proved a handful for everyone. 203 off 40 overs was not an outrageous ask, especially not after the fireworks of the Varsity T20 match the week before when Oxford achieved a total in excess of this in half the overs. A lot seemed to depend on the star from the Varsity game, Sian Kelly, and early signs were good as Oxford took 23 off the first 3 overs (with MCC returning the compliment with a few wides of their own). Sian Kelly was unable to repeat her heroics from last week however – driving to mid-off for just 13 – and after 9 overs, Oxford were 42-3. A collapse would not have been surprising, but to their credit, keeper Ellie Ingram and captain Immy Brown combined to add 68 in 15 overs. At 110-3, the game looked evenly poised, but having missed out with the bat, Charlotte Edwards made up for it with the ball, turning in the impressive figures of 2-6 off 6 overs. Nikhila Ravi also bowled with impressive loop to take 3-34 (or at least we think she did – given that we were convinced that she and her twin sister Neeraja were doing their upmost to be indistinguishable to the scorers). Ingram fell for an excellent 41 off 55 balls, and although Brown continued her lone hand thereafter, she was the last wicket to fall for 39 off 66 balls, to a smart catch by Claire Taylor off a full blooded pull. So an eventually comfortable win by the MCC – but at a time when cricket participation is under scrutiny at all ages, levels and indeed sexes, the enthusiasm and skill shown by the Oxford team does them credit and provides optimism for the future. I suspect we’ll be hearing more of at least a couple today’s players. On a clear but somewhat chilly night at The Oval, Middlesex easily retained the Pemberton Greenish Cup, with a convincing win over their London rivals Surrey. The evening began with the presentation of a county cap to Surrey’s veteran glove-butler Kirstie White, who has had a great start to the season, and recently made her highest score for the club – a 76 which carried them to victory against Yorkshire in the County Championship. Out in the middle, Middlesex won the toss and elected to bat, and despite losing two early wickets (Tash Miles, LBW to Nat Sciver for a duck, and Sophia Dunkley, stumped off Amy Jenkins for 5) they made the most of the powerplay, reaching 44-2 from the first 6 overs, as Beth Morgan took a fancy to some inviting boundaries all around the wicket. Morgan was eventually out for 31; but Izzy Westbury then picked up the scoring rate again in the middle overs, playing some inventive reverses alongside more classical shots on her way to an entertaining 22. Surrey took wickets at regular intervals, with Kirstie White stealing 3 stumpings and a catch, but Middlesex continued to find the boundary often enough to finish on 123-9, with India Whitty 14 not out at the end. In reply, Surrey needed runs from White – their leading run scorer in the County Championship – and/ or Nat Sciver, but both were out cheaply: White stumped by Whitty off Hartley for 1; and Sciver caught by Westbury at cover off Naomi Dattani for 5. Thereafter, the worm tells the story: Surrey were behind the rate from the first over, and slowly slipped further and further into the red, as Middlesex excelled in the field – Whitty making 4 stumpings; Tash Miles superbly running out Sophie Pout for a duck at the non-striker’s end, with a direct hit from point; and Sophia Dunkley taking a fantastic catch, diving forward at mid on, to dismiss Amy Jenkins off Alex Hartley. Although Holly Huddleston dropped Holly Knight off a very difficult chance in the 17th over, by that stage it was all somewhat academic, with Surrey having largely given up the chase; but Middlesex kept plugging away, and the hosts were eventually bowled out in the final over for just 88. The coming of the 50-over Kia Super League in 2017 means that many of tonight’s stars will no longer be playing county cricket after this season, so the future of this fixture in its current format has to be somewhat uncertain; but with over 1,000 local schoolgirls having attended the coaching clinics which were held earlier in the day, with the chance to be inspired by the likes of Charlotte Edwards, Heather Knight, and Danni Wyatt (to name but three) it must be hoped that this is not the last we’ve seen of the Pemberton Greenish Cup. 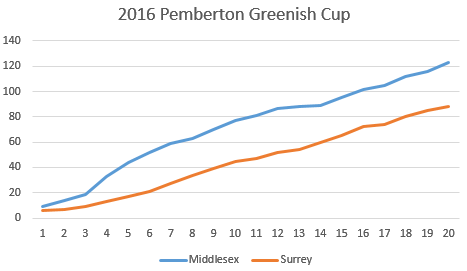 Tomorrow – Tuesday 24th May – sees The Oval host the second annual Pemberton Greenish Cup between Surrey and Middlesex. Last season, Middlesex took home the silverware, thanks to a solid 46 from Fran Wilson and some tight bowling from Alex Hartley. The Middlesex “Meatballs” have to be narrow favourites to retain the trophy, having already beaten their London rivals once this season, in a low-scoring encounter in the Women’s County Championship, when Wilson and Hartley were once again the linchpins; though they will be without the injured Wilson at The Oval. If Surrey are going to overturn the odds, two key players will be Kirstie White – their wicket-keeper batsman, who is averaging 49 in the County Championship – and skipper Cecily Scutt, who is the leading wicket-taker in Division 1 with 10 wickets, including a five-for against… Middlesex! The action gets started under the lights at The Oval at 6:30pm, but if you’ve got kids, get there early as there will be all sorts of activities going on from 4:00pm, including rumoured appearances by some England stars! And the best news… it’s all free – so we’ll see you there! CRICKETher reporter Ben Gardner was at Friday’s Varsity match to see a memorable innings by Oxford’s Sian Kelly. Result: Oxford won by 162 runs. Sian Kelly produced a sustained and controlled assault on the Cambridge bowlers, paving the way for a victory by 162 runs, the margin of which did not flatter Oxford in the slightest. Kelly’s innings, of 102* from 61 balls, was so brutal and calculated, it seemed remarkable that it wasn’t her best; Kelly made 127* in the reverse fixture last year. From the moment she put away Holly Tasker’s first ball to the square leg boundary to when she walked off the field 61 balls and 102 runs later, she exuded control, rarely seeming troubled by the bowling. Runs were plundered all around the ground, with the favouring of the leg side being more a result of the full tosses bowled by Cambridge, invariably pumped between square leg and midwicket, than any lack of ability through the off side, as demonstrated by perhaps her best shot, a drive behind point for four, which brought up fifty. The pacing of Kelly’s innings too was something to behold. To begin with, she exploded. After 6 overs Kelly was 46 off 24, Oxford were 74/0, and Cambridge were chasing the game, four consecutive fours of one Holly Tasker over being a particular highlight. Then, with the Powerplay finished, she switched gears, content to push the ball around, while still picking up regular boundaries, before accelerating again, moving from 83 to 97 in just 5 balls. This was a masterful innings, and Kelly simply was a class above the bowling. She looks ready for greater challenges, and perhaps more game time alongside her twin sister Marie, Warwickshire’s captain, awaits. Tina Gough, who turned over the strike well and played some excellent shots of her own, was an excellent foil for Kelly. When she was out, for 52 off 50, the scoreboard read 173/1 off 16.3 overs, and the match was almost over as a contest but Cambridge did well to keep their heads up and stick to the task. It mattered little in the grand scheme of things, but Cambridge bounced back well to restrict Oxford to 33/2 off the last 4 overs, and on a different day, without two batters in such fine form, such a recovery could have been the difference. While the full toss and no ball counts show there is much improvement to be had, this was certainly an attack with potential. Still, a target of 205 seemed a tall order, and Oxford put the result beyond any doubt with an immaculate bowling display, with perhaps the only disappointment being that Cambridge bettered their 36/8 against Oxford in a league match 2 weeks ago by 6 runs. The first three bowlers used by Oxford all represent various counties, and their extra quality showed. Sam Moore moved the ball away at pace, while her Oxfordshire colleague Helen Baxendale was metronomic in her line and length. Captain and Berkshire opening bowler Immy Brown was even more impressive, picking up 3 of the top 4 batters with her skiddy pace, as well as running out the 4th. Away from the county stars, Oxford showed impressive depth; Sarah Attrill’s loopy accurate bowling especially is so difficult to get power behind, and therefore ideal for a T20. In the field too Oxford were sharp, and though there were a couple of missed run outs, these were more a result of smart work to earn the opportunities in the first place. However, while it would be difficult to overstate how well Oxford played, there were some simpler areas where Cambridge could have improved. Their fielding was one such, but perhaps more inexcusable was their running between the wickets. There were several occasions where they chose not to push the fielders, or to attempt to rotate the strike, which meant Oxford were under almost no pressure. The boundary balls weren’t there to be hit to be sure, but the fact that no batter had a strike rate over 50 tells its own story. This was in stark contrast to earlier in the day, when Oxford wasted no opportunity to score runs, turning the strike over regularly and always looking if the second was on. Cambridge, it has to be said, were missing key players. Most notable was Frankie Barber, who made fifty in the Varsity match at Lords last year. She is the only full Blue currently at Cambridge. Oxford and Cambridge examinations do not take place at the same time so finding a date when one university is not unfairly disadvantaged is tricky. However, making Cambridge play away while it is their students more likely to be affected is unfair, and something you’d hope the organisers would look at for coming years. Still, to focus on such small details would be to miss the greater joy of the day, which was of a well-trained and extremely talented team playing to their potential, and of one special batter playing an innings that will be remembered by all who witnessed it.